Lyn Wetzig describes the experience of attending her first Alfesta (Published in May 2003 issue of Per Sempre Alfa). It was one of those times that you wished could go on a little longer - and all thanks to the Queensland AROCA Committee who not only organised Alfesta, but had kept the Club running with functions, outings and meetings as well. I bet they were the only ones who were glad to see the end of that Easter weekend! Rydges, Caloundra was the venue, and we arrived there on Thursday evening for a Club barbecue, followed by a brief run-down on the weekend. Bright yellow tee shirts, along with our nametags, were passed around, so we introduced nametags to each other and then retired to our rooms to unpack. After a good night's sleep, we flocked into the meeting room and faced the first of many buffets - cereals, fruits, croissants, bacon, eggs, hash-browns, sausages, baked beans, toast, juices, tea and coffee! Suitably stabilized by the food, we wandered off to the beach to make our kites. After being divided into groups, given instructions, sticks and fishing line, (hook, line and sinker), we scattered to make our kites. Passers-by were greeted by the sight of groups of people, head down and tails up! over blowing sheets of paper lying on the ground, discussing angles, stick length, saddle size, and decoration. Young Cameron drew faces of happy Alfistis for our decoration, while other groups came up with the quadrofoglio, and several variations on the cross and serpent. Leigh and Kim were the first to fly their kite, followed by others, all of which soared effortlessly up to the clouds. Ours, on the other hand, seemed to be possessed by a Kamikaze spirit, leaping briefly, before spiralling madly earthwards again. Cest la rotten vie! The group beside us had a kite which seemed determined to attack them, rising encouragingly, and then hurtling nose first directly towards the nearest person, resulting in screams and people diving for cover. After morning tea (back at Rydges - great biscuits!) we then set out on our navigation run to The Big Pineapple. Lloyd and Leigh Muller joined us, and were relegated to the back of the 156. Lloyd wisely kept his mouth shut and allowed Leigh and Lyn full rein (or reign) with navigation. Through lovely green valleys, rain-forested hills and peaceful pastures the Alfas swooped, that familiar note of the Sporting Heart echoing from hill to hill. We met up in the car park of the Big Pineapple, and proceeded to Lunch, which was a�.. buffet, so we buffeted (and you can take that as "buffey-ed" or "buffe-ted") our stomachs with food. After lunch, the committee checked on the items that had to have been collected and carefully measured sticks, shininess of rocks, things that dogs do (besides the obvious) and so on. The afternoon was free, so we headed back for a nice longish walk along the beach, ready to face� the evening meal which was another� buffet at Rydges, followed by a "driver's roast" with Peter Wherrett and Kevin Bartlett. A wealth of memories, with a generous helping of humour, poured out of these two gentlemen, who showed such a willingness to share them with us. A very relaxed and friendly evening! Saturday morning saw us devouring the breakfast� buffet, before being handed our morning tea and map to get to the Eumundi markets. This time we threw Jan into the back seat, and headed north. Eumundi was overwhelmed (to say the least) with Easter weekend shoppers, so we took a deep breath and plunged into the crush heading up the ramp and didn't emerge until we popped out like corks onto the street. After a restorative coffee at the CWA hall, we piled into our vehicles and headed out on the Pomona nav run. 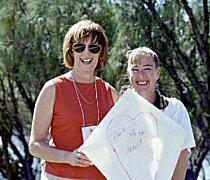 Jan remained tight-lipped about anything to do with the run, but as we proceeded over hill and dale, her voice came, at intervals, from the back seat, saying, "Go on Pete, you can take him - go, go, go!" but another voice spoke gently from the front seat, saying "no, no Peter, keep to the speed limit." We did have one close call in passing two Camrys on a narrow road with crumbling shoulders. As we hurtled past, the lead Camry moved into the middle and put his brakes on. Bless his little cotton socks! With a flick of his wrists, Pete steered past him with the 156 in full song, and left him in a cloud of dust. Yes! We all settled down at the Pomona Pub like a flock of birds - some on the veranda, some out the back and some in the dining room, but a head count showed that two people were missing (not mentioning any names, but they were in an Audi!!!) whom we had passed some miles back. We were just at the stage of searching for their mobile number when they came in, after discovering half of the North Coast hinterland, it appears. I think the fact that they actually ended up at the Pomona Pub was amazing! After lunch, which we devoured in our usual enthusiastic manner, we walked over the railway tracks to West's Majestic Theatre - the oldest authentic silent movie theatre in the world, established in 1921. Mr. Ron West welcomed us, and we straggled into the theatre, clutching our supply of jaffas, which pretty soon were starting to hurtle around the room and rain down on the floor. Mr. West had selected The Speed Spook for the movie, and he sat at the pipe organ and accompanied in fine fashion. We booed, cheered, hissed, laughed, ate jaffas and generally enjoyed ourselves. We'll all remember the "town that was automobilious"! (Actually, Jan felt quite jaffabilious after finishing up a pack of jaffas.) After a restorative cuppa and cake, we drifted off back towards Caloundra. Ettamoggah Pub was our meal-venue for our fancy dress night. Different interpretations of the Sporting Heart emerged one by one. We had gone as the Sporting Hearts - King and Queen, Kim came as the Queen of hearts, the McKeon family came as an Ace, Jack, King and 10 of hearts, so between them they had a Royal Flush; Phar Lap appeared and galloped around the room; a dapper gentleman and his gentlewoman, dressed for driving in their Alfa, were there, Tony and Jude were dressed in boxes with photos of their vehicles - every one in their stable has a sporting heart, and another Phar Lap turn up. (I think this version won by a nose!) Denis Sando turned up as the all-round sportsman whose heart belongs to Alfa, which one First Prize (men's) and the Dale Doyle dressed as the boxer which is the heart of the Sud won the women's costume. First prize (group) went to the Royal Flush, and then they invited Pete and I to join them and we shuffled the deck and then played Snap! The band played, the buffet was demolished (we were getting quite good at this by now! ), dancing, wine, laughter�. a group of people also clustered around the games at the back of the room, and raced on cars and bikes. After a boisterous night, the bus collected some of us and we headed back to our beds to recuperate while others partied on. Sunday dawned, and yet another� buffet breakfast - with an Easter Bilby beside each plate. 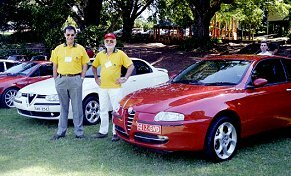 A frantic washing and polishing of cars followed for the show and shine, and Ken and Lloyd scrutinized each Alfa minutely, whilst the owners stood nervously by. After show and shine, some toddled off to church, while the rest took off on another navigation run. What a pretty drive it is through the green rolling hills from Palmwoods, climbing up towards Montville! Pete, much to his chagrin, was trapped behind a NSW ute, which proceeded cautiously up the hill, but we eventually arrived in Montville, and parked our 156 along with the rest of the stable of Alfas. It was wonderful to see the 64 cars, including four classic Montreals and five future classic 156s, lined up around the school oval. Lunch was supplied by Monkey Business - and what a picnic! As we finished, clouds rolled over ominously, and we had a brief, sharp shower later in the afternoon. Some of the ladies scattered to the craft shops, while some of the men stayed and chatted about cars. (Have you noticed how guys stand around in a semicircle, with their arms crossed, or hands in their pockets, all gazing at the car in question, and chatting? Then one or more will walk up and down, checking out the tyres, the interior, or the paint job, or the lines�.. They can do this for hours! It's called an assemblage of alfistis, a clump of car lovers, an ensemble of enthusiasts, a run of racers - can you come up with any more?) A few of us had a coffee and then bravely faced the ice cream shop in Maleny. Folks - it is fabulous! We then headed back to Caloundra driving along the ridge, watching rain greyly veil the coast. Attired in various interpretations of the word formal, the Alfistis clustered together for our final dinner. It was a lovely meal - prawns, Caesar salad, salmon, steak, cheesecake and 5 huge profiteroles (alternate drop). 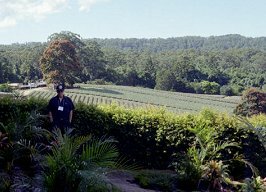 A Highland kilted NSW committee were piped in, and the location of Bowral in the NSW Southern Highlands was announced for the 2004 Alfesta. Trophies were awarded (the Ray Sharp Observation/Navigation Run Trophy was won by el presidente, and the social secretary, ooouuuurrrrrr ooowwwnn [drum roll] Ken and Kim Percival! ; The Bob Gardiner Memorial Trophy went to Alan and Glenda Wheeley, and the Harry Lewis Spirit of Alfesta went to Jason & Dale Doyle), and then some retired (perhaps waddled off might be a better way to put it!) to bed, while others retired to Legends to watch the San Marino Grand Prix. It was a bleary-eyed bunch of Alfistis who straggled in for their last breakfast together on Monday morning. The buffet breakfast was attached with gusto, even as we were all complaining of shrinking waistbands on clothes. The final unraffle was drawn and then thanks were given to the committee for the outstanding success of this Alfesta. Goodbyes were said, packing done, and then we surged out onto the highway for the trip home, after four days of fun, food (! ), fellowship - and driving.